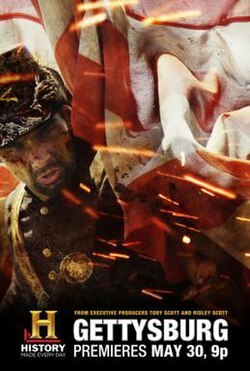 Gettysburg is a 2011 American Civil War television documentary film directed by Adrian Moat that was first aired on May 30, 2011 (Memorial Day) on History. This two-hour documentary film, narrated by actor Sam Rockwell, commenced a week of programming by the History channel honoring and commemorating the 150th Anniversary of the American Civil War. Gettysburg showcases the horror of the pivotal 1863 Battle of Gettysburg by following the stories of eight men as they put their lives on the line to fight for what they believed in. On February 9, 2011, President and General Manager of History channel, Nancy Dubuc, announced the channel's partnership with the Civil War Trust and the National Park Foundation for GIVE 150, a massive educational and fund-raising initiative to enhance Civil War education nationwide, and to protect and preserve battlefields and other key sites from this pivotal period in American history. Dedicated to highlighting the 150th anniversary of the American Civil War an entire week of programming will be set aside featuring various new and old episodes of shows showcasing the war. In 2011 Civil War Week will commence on Memorial Day Monday with war themed episodes of Pawn Stars followed by the television premiere of Gettysburg. Throughout the week there will be new episodes of American Pickers, reruns of Brad Meltzer's Decoded, Modern Marvels and other various shows, along with the premiere of Lee & Grant a television documentary film directed by John Ealer. The production was filmed in Western Cape, South Africa. Companies which signed on to sponsor the title and the Civil War Week project include Geico, Ram, and Bank of America. Wanting to entice young and middle aged men to watch the Memorial Day special, senior director of consumer marketing at History Ann Marie Granite, went back to Microsoft's Xbox 360 to help promote the film. Features allow users to compete for prizes by downloading free market content from the Xbox Live store, other features include an interactive map of Gettysburg that provides historical background on each day of battle and campaigning videos that showcase the movie. ^ a b "Ohio Wesleyan Stars". myOWU. Retrieved 2011-05-28. ^ "History to Honor and Commemorate". the Futon Critic. Retrieved 2011-05-29. ^ a b "Ridley Scott and The History Channel to Develop American Civil War Documentary GETTYSBURG". Dave Trumbore. Retrieved 2011-05-29. ^ "Civil War Week Guide". History Channel. Archived from the original on 2013-01-25. Retrieved 2011-05-29. ^ Szkotak, Steve (2011-05-28). "Scott Brothers Capture Civil War with Gettysburg". Bostom.com. Retrieved 2011-05-29. ^ "Marketing Microsoft". ClickZ. Retrieved 2011-05-29.